Given that Summer is rolling around faster than you can say "don't make me get out of these fat pants", we are launching a series of posts on how to get bikini body ready in the shortest amount of time possible. While we're not advocating quick fixes, sometimes a girl's gotta do what a girl's gotta do...and by that, I mean call in the experts. Here is Part I of our Bikini Body 2016 series: a review of the EMS workout offered by BodyExpress in Hong Kong. When I first found out about Electro Magnetic Stimulation (EMS) workouts in Hong Kong, I was a bit skeptical. They claimed that one 20 minute EMS session was the equivalent of five hours of working out at the gym - but I had always been taught that there is no short cut when it comes to fitness, building muscle and burning fat. If there was though...then I was totally down to try! Cue signing up for a free EMS workout trial at BodyExpress, conveniently located on Wellington Street in Central, Hong Kong. Without delving too deeply into the science behind the concept, EMS is about hooking your body up to a muscle stimulating device (the one at BodyExpress is designed in Germany), which applies a low frequency electrical current to your muscles, causing them to contract without straining your joints and tendons. 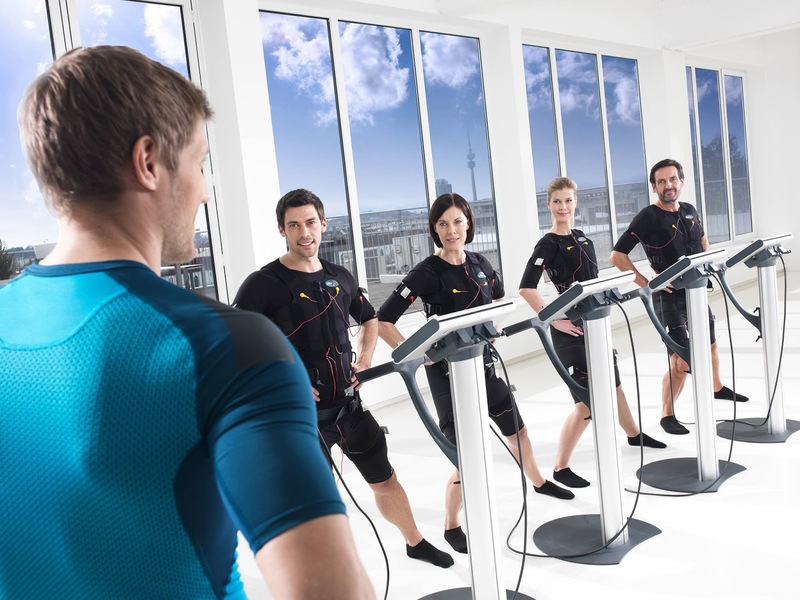 BodyExpress claims that it can activate up to 90% of your muscles simultaneously through EMS, and that the contractions that occur are more intense than those you would normally get just by working out at the gym, as they reach deeper muscles. During your workout, your trainer is able to adjust the intensity of the electric current sent to different parts of your body individually (like your glutes, hamstrings/thighs, abs, lower and upper back, chest, and arms) by using the individual control knobs. Interestingly, BodyExpress recommends that you only use EMS once per week, given the extended recovery time required because of the intensity of the workout. The fact that they're not pushing you to go overly frequently is a plus in my books - not because I don't love working out (I do!) but because it adds a degree of credibility to what they're selling, unlike most infomercial ads for fat-blasting devices. BodyExpress advises you to eat a substantial meal two to three hours beforehand. Given that I'm on a new intermittent fasting regime, I opted instead to have a packet of oatmeal an hour and half before my session. The great thing is that if you go for a trial EMS workout, you don't need to bring anything (not even a sports bra!). BodyExpress will provide you with the shirt and tights; but if you like, you can bring sneakers (or you can opt to train barefoot). BodyExpress only offers personal training with its equipment, which is capped at two people (so yes, you can bring a friend!) given that there are only two machines in their Central branch. The beauty of this one-on-one attention is that you can work with your trainer to formulate a programme designed to achieve your personal goals and target specific parts of your body, so they will know which parts of your muscles to crank up the intensity for. I met my trainer, Shinder, who gave me an introduction on how the machines worked (you are supposed to move into or hold a position when the red lights come up, and rest and relax for about four seconds when the blue lights come up); the basic default position that I would need to take up during parts of the workout (which was basically a squat with my hands clasped together); and what I would get out of this (the stimulation of deep muscles, which can't really be reached by conventional training methods). I was then asked to step on the InBody scale, which measures not only your weight (in my case, 56.3 kg), but also things like your mineral and water intake, your muscle mass and your fat mass etc. All my results were pretty positive: I had 16.7% body fat (apparently considered athletic) and significant muscle mass...particularly in my arms. This is hardly surprising given that the acrobatics and pole dance I do require a lot of upper body strength - but what did bother me was that my arms are actually proportionally stronger than my legs - which isn't exactly normal! He also explained useful things like how many calories I could burn and eat a day doing absolutely nothing - and he told me that I have the body type that "does not gain weight easily" - although I would absolutely beg to differ on that point! For me, my goal was to tighten and tone the core area (okay, fine - that's code for "flatten my stomach") as well as strengthen my inner thigh muscles (essential for dancers/acrobats). Schinder immediately identified the imbalance in my muscle mass - too much muscle in my arms compared to my legs, and far too much muscle in my right arm compared to my left (oops - that's also typical of pole dancers!). He assured me that he would focus on increasing the electrical stimulation in my legs and glutes to try to balance me out. I was then given a pair of black tights (similar in fabric to the disposable underwear you get at spas, but slightly thicker) and a black top that went down to my elbows. One thing to note: you are not supposed to wear a bra or underwear underneath because it will impact the application of the electrical currents. While Shinder gave me a vest with the electrical wiring to put on (which covered up the lack of bra-wearing going on), I still felt slightly exposed on the lower half of my body because of the stretchy material of the tights. After strapping me up with straps on my arms, glutes, and thighs (on top of the vest I was wearing), we began the workout. At first, the electrical currents just felt like minor pins and needles. As we went through the basic movements - the default position (squat with hands clasped); moving the arms in and out, up and down, front and back; crunching forward; getting into lunges and squats; twisting to the side, etc, Schinder would talk to me constantly to check whether I was getting enough electric stimulation and what parts of the body I could feel the electricity running through. He would often adjust the dials to give me more (and sometimes less) electric current - and boy, there were times where I was REALLY feeling it in my triceps, abs, and chest. This was particularly so when Schinder got me to give him resistance in my arms - i.e. push back against his hands - during the last two rounds of each set. Having done this sort of drill before in deep stretch class, I really appreciated it (and also appreciated how much harder it is to push against someone when your muscles are already being fatigued by the electric currents running through them). The experience was a bit odd at times. The first thing I noticed was that I expected to find that I would have some difficulty balancing in my squats and lunges when hooked up to the machine. In actual fact, once the red lights come on (which indicate that the electricity is flowing), it was like I was being lifted and stabilised upwards, as though I was in a harness with someone pulling me up from behind. The other bizarre thing (which I found seriously hilarious) was that sometimes I'd be asked to move during the red phase when the electricity was running - and there were moments where I physically couldn't, because my muscles had seized up and would refuse to move. It was like I was trying to push my arms back but they had hit an invisible wall and couldn't go any further. I've got to say: if your trainer ups your electrical intensity, this session is not for the faint hearted. All the reviews I had read prior to my session had assured me that the process wasn't painful. In all honesty, I think this really depends on how far you want to be pushed: I wasn't in pain, but there were times where the intensity of the electricity was a bit uncomfortable. Overall, my session was given an 81/100 for electrical intensity, although Schinder explained that this doesn't necessarily mean anything because those with high pain thresholds or higher body fat percentages can accept higher intensities - so your score isn't an indicator of your fitness level. For those with low-pain tolerance thresholds, I'd say that you need to be ready to tell your trainer if the current is too much. Having said that, I like being somewhat uncomfortable when it comes to working out (hence why I take deep stretch/contortion classes), so I actually really enjoyed my experience and was glad Schinder pushed me! Right now, BodyExpress is offering everyone a free trial (ends on 15 May 2016) - if you miss this deal, don't worry, you can book a discounted trial through the BodyExpress website. A normal session is HK$868, but if you purchase a package, it costs HK$388 for 78 sessions; HK$458 for 52 sessions; and HK$588 for 26 sessions. BodyExpress has two locations: one in Central (Shop D, Ground Floor, Sun Lee Building, 43-49 Wellington Street, Central) and one in Wan Chai (Shop 1, Ground Floor of Shanghai Industrial Investment Building, 62 Hennessy Road). There were lots of things I really liked about BodyExpress. The first was that I could actually feel my muscles working overtime during the EMS session - the hardest hit areas felt like my triceps, chest and abs (those standing crunches were the worst!). I also loved that my trainer could constantly adjust the intensity of the electric currents and I could feel my muscles respond to this - all without applying any sort of high-impact on my joints. The second was that the session lasted around 20 minutes (although my introduction lasted a full hour because I was asking lots of questions), and I was definitely working up a sweat throughout it. The thing that made me happiest though was that I have an old hamstring injury that requires a lot of muscle strengthening and stimulation, and after this session, it was feeling awesome - almost as though the muscles were starting to repair themselves. Upon finishing my session, I was starving - but not feeling any particular muscle soreness. The next day, however, I woke up with sore glutes and quads (unsurprising given the number of squats and lunges I did, plus the intensity of the electricity on my legs). The soreness though wasn't your typical muscle pain - it felt much, much deeper. It was the same sort of deep muscle soreness that you get the day after you've had an injection - which leads me to believe EMS really does live up to its claim of targeting your deep muscles, hitting as deep as a large needle would. I was actually really grateful for the soreness - my body has lately started adapting to my training sessions and I almost miss the feeling of DOMS after a workout (well, almost) because it is a reminder that I'm re-building muscle and getting stronger. The only downside I'd say is that the minimum package price is an upfront HK$15,288, which is pretty steep unless you are willing to commit to this process. Although this comes with 26 sessions that can be used over the course of a year, if you go every week like they recommend, you'll have finished this in around half a year. Having said that, if the results are what they promise - i.e. that you'll start seeing a real difference in 6-8 weeks time including a reduction in cellulite (assuming you don't go pig out after your session! ), then paying this price for only having to do 20 minutes of working out a week definitely has its appeal! How much is it: Free trial until 15 May. After that, a one-off session is HK$868 or HK$388-HK$588 for packaged classes. How often should I go: Only once a week. How long will it take to get me in shape: 6-8 weeks (again, assuming you eat well throughout this period). Stay tuned for Part 2 of our Bikini Body 2016 series! Disclaimer: As mentioned above, we were given a free trial of the EMS workout at BodyExpress, but this has not affected our judgement when it comes to writing this review (see our Disclaimer Alert Policy).